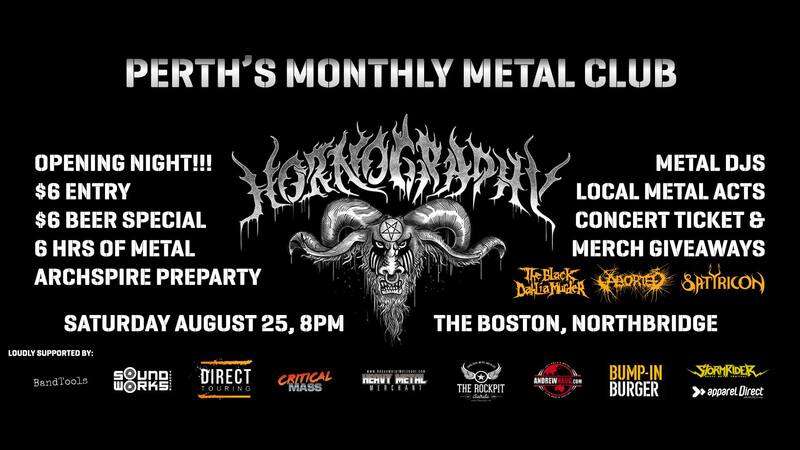 HORNOGRAPHY PERTH METAL CLUB – OPENING NIGHT! The opening night of Hornography is here! A Perth Metal Club embracing and reviving the local metal scene. In this first edition you can expect killer bands, extended breaks with great metal tunes, speakers, giveaways, metal stalls and all round good times! SANZU – With a crushing sound and a massive impact, Sanzu will close the night in a heavy heavy way! Nucleust – The first ever band to play Hornography will be Nucleust! Extreme, progressive and captivating, starting the night in style. A huge thanks to all the sponsors who have come on board to sponsor & support this beast!